The high-voltage power lines that span Florida's St. Johns River and touch down on Blount Island were installed long before the Jacksonville Port Authority landed business from ocean-crossing cargo ships whose size is growing in leaps and bounds. The transmission lines aren’t as visible as the nearby Dames Point bridge, but the cables are just as much of a restriction on the size of cargo ships that can sail under them on the way to unload at Jacksonville’s port. JaxPort officials, who are pursuing a $484-million river deepening project so Jacksonville can handle the next generation of jumbo-sized cargo ships, say the power lines don’t pose an obstacle to their push to compete with other Southeast ports that also are deepening their harbors. The rapid growth in the size of cargo ships caused the Port Authority of New York and New Jersey to embark on a $1.3 billion project to raise the height of the Bayonne Bridge so it is 215 feet above the water, an increase of 64 feet. City Council member Lori Boyer said she wants JaxPort to give a full assessment of all the factors affecting the drive to make Jacksonville a top-tier port, including items like the transmission lines that aren’t covered by the $484 million cost of deepening 11 miles of the river. “I just want to see all the pieces, because sometimes we do these [projects] where we look at one piece, and then there are two or three things that happen as a result that have big price tags that we’re not aware of,” Boyer said. The power lines have a permitted vertical clearance of 175 feet, according to JEA. The Dames Point bridge has a vertical clearance of 174 feet for ships at high tide, compared to 186 feet for the Arthur Ravenel Jr. Bridge at the port in Charleston S.C., and 185 feet for the Talmadge Memorial Bridge at the Savannah, Ga., port. Currently, cargo ships going to the TraPac terminal on the west side of the Dames Point bridge have no problems sailing under the bridge. 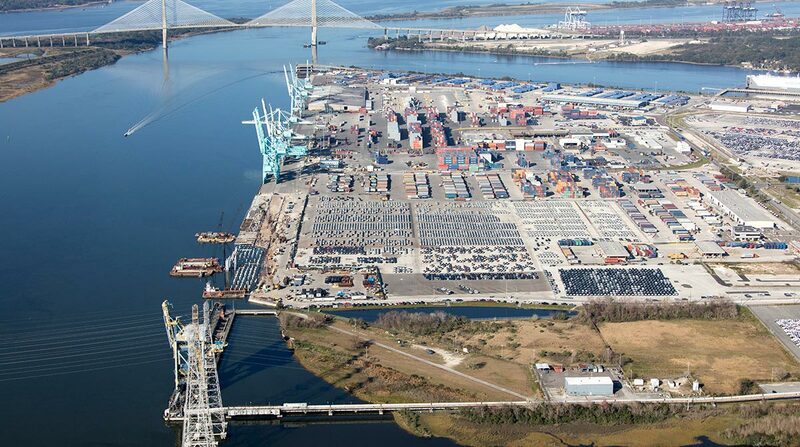 JaxPort plans to relocate TraPac to the east side of the bridge, at Blount Island, which would eliminate the Dames Point bridge as a future obstacle to the passage of the larger ocean-crossing cargo ships. “We saw that as a positive,” TraPac spokesman Michael Munz said. Cargo ships still would have to sail under the transmission lines spanning the river to reach the Blount Island docks. But Munz said that is not a concern for TraPac. Rubin said the transmission lines are a bigger issue for cruise ships, which sail with much more of the vessel riding above the surface of the water. JaxPort plans to ask in two years for $47 million to $150 million in city funding for the deepening project, depending on how much federal funding JaxPort has secured. Congress authorized deepening 13 miles of the river, which would have taken the project all the way to the west side of the Dames Point bridge where TraPac operates its current terminal. JaxPort announced in June it would shorten the deepening, which would necessitate moving TraPac’s operation a couple of miles to Blount Island. JaxPort said the shorter dredge would reduce the cost by about $200 million. Rubin said the height restriction posed by the Dames Point bridge was not a factor. The largest ship to call on Jacksonville so far, the MOL Bravo that docked at TraPac in June, had capacity to carry 10,000 cargo container units. Even bigger ships could come to Jacksonville and make their way under the bridge and the power lines, said Capt. Hardee Kavanaugh, president of the St. Johns Bar Pilot Association, which guides big ships up and down the river. For instance, the port authority in New York/New Jersey announced a 13,200-unit ship was able to easily go under the raised Bayonne Bridge. Kavanaugh said that same ship could go under the Dames Point bridge and the power lines, but it would be “very, very tight” at the ship channel’s current 40-foot depth. He said if the channel were deepened, there would be more room to spare. He said that’s because with a deeper river, the hull of the ship can ride lower in the water, which in turn means less of the ship is above the water line.